Learn more about how Mattei's cutting-edge BLADE Series is the ideal solution for your business. Mattei's BLADE Series sets a new standard for compact, quiet, commercial-duty air compressors. Engineered to produce air with up to 20% less energy than traditional screw compressors, the BLADE Series offers unmatched efficiency and unrivaled performance. 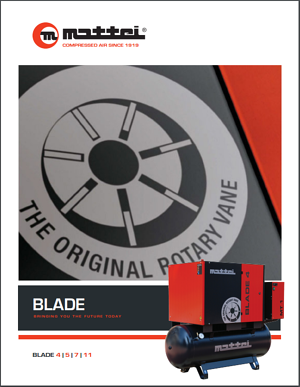 Download the BLADE Series Product Guide to learn more about the benefits of the complete BLADE line, including our recently released BLADE SE Quality Air Station and BLADE Duplex compressors. Please complete the form to the right to obtain your free copy of the BLADE Series Product Guide.